Picture the scene: You come home after work feeling too exhausted to cook – only to find a delicious meal worthy of a Michelin-starred restaurant waiting for you. 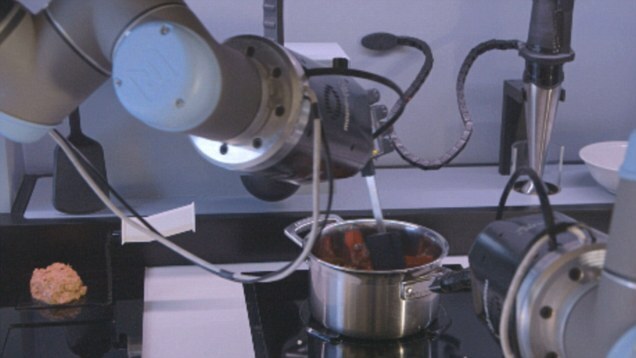 It sounds like a fantasy, but it could be about to come true thanks to a robot chef developed by British scientists. 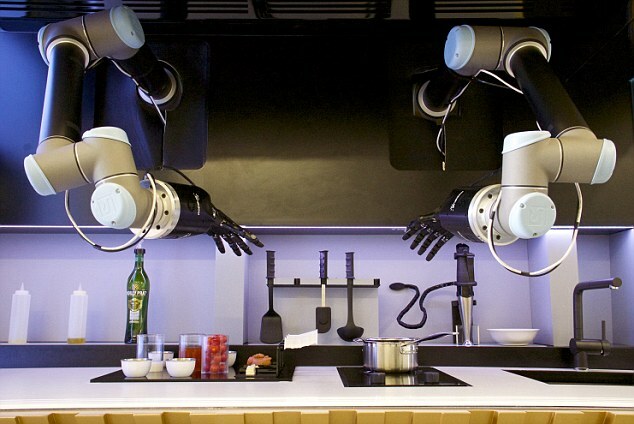 They have come up with a set of robotic arms so sophisticated that they are capable of cooking meals from scratch. Scientists at Moley Robotics spent almost 18 years developing the hands, which are each governed by 24 motors, 26 micro-controllers and 129 sensors. 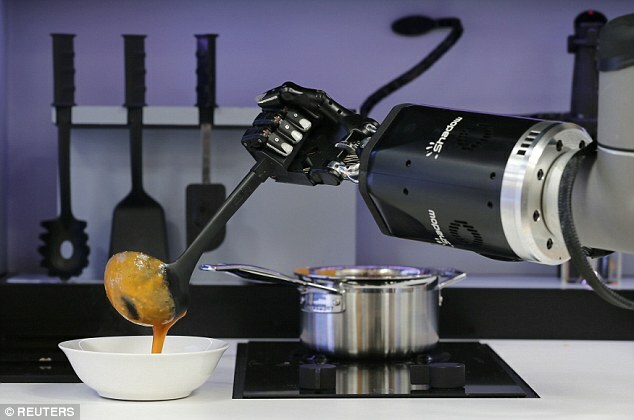 According to its creators, the arms can chop, stir, whisk and baste well enough to recreate almost anything you would care to eat, whether it is a simple home-cooked supper, or an elaborate concoction designed by a world-class chef. The hands move a little slowly, hovering strangely above the work surface whenever they are not busy, but they imitate human movements closely enough that they can do things such as wipe a spoon on the edge of a pan to prevent drips. The device will be sold from as early as 2017 as part of a purpose-built high-tech kitchen, priced at around £10,000, which includes an oven, hob, dishwasher and sink. Working from a small office in Islington, North London, they used to sell a few dozen devices a year, primarily to other scientists who used them for their own research. Even Nasa is understood to have ordered a pair to ‘inspire’ its engineers. 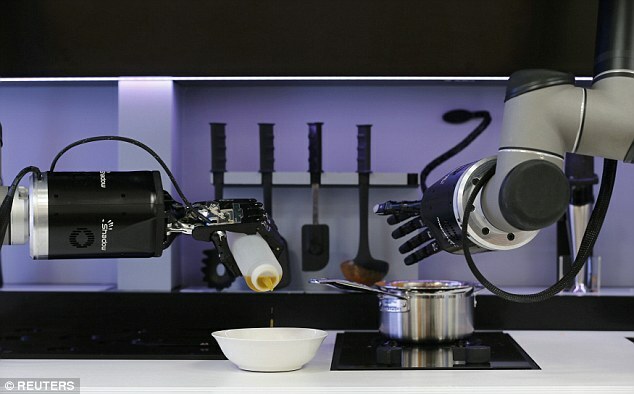 But last year, after Russian engineer Mark Oleynik approached the team with the notion of turning the hands into an everyday household gadget, the concept of the robot chef was born. Even if there are a few splatters, it shouldn’t matter – the gadget will load the dishwasher and wipe down the work surfaces afterwards. The arms will tuck up out of the way when not in use, making space for their owners to get their own hands dirty. Mr Oleynik, who is spearheading the project, said: ‘All the things which are possible with the hand are possible here. There is no limitation. The only cuisine that is off the robot’s menu at the moment is sushi, which requires exceedingly steady pressure and nimble fingers to make, but the team plan to conquer that as well by the time it goes on sale. 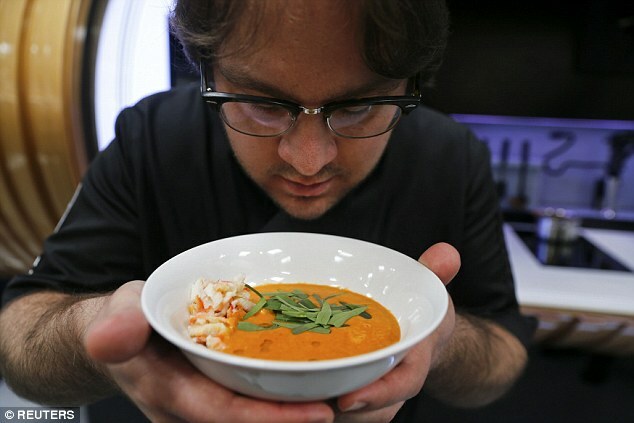 By that point, they claim, users will be able to order meals from an iTunes-style library of recipes devised by professional chefs, making it possible to tuck into Michelin-standard food on a daily basis. 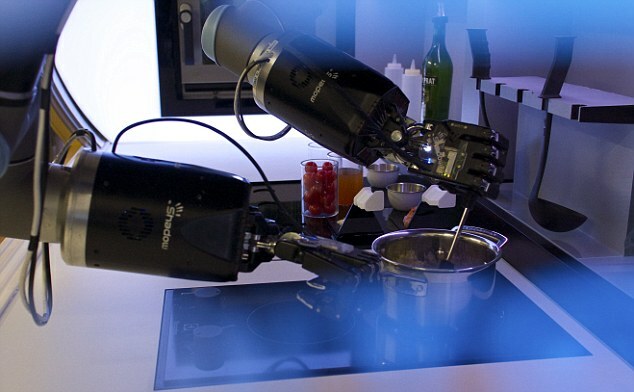 People will also be able to train the robotic arms to cook their own favourite family recipes, by demonstrating them a few times while wearing high-tech gloves and wrist-bands. Users will be able to ‘order’ dinner on their way home, or breakfast for when they wake up, using an app on their smartphone, picking recipes depending on the ingredients they have in stock. They will also be able to choose dishes based on their nutritional content. And just in case, the unit has emergency equipment if there’s a fire.